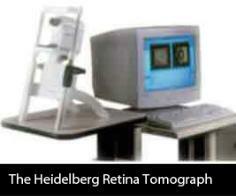 individual to undergo an annual eye examination, especially if there is a risk factor for such a blinding disease. (b) Difficulty in dark adaptation. (c) Bumping into things at unfamiliar places. (d) Blurred or foggy vision. (e) Coloured halos (rainbow coloured rings) around lights. 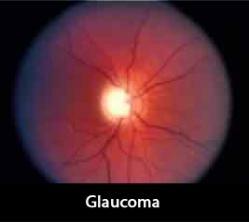 show that Glaucoma develops with increasing age to the tune of 2% per decade of life. 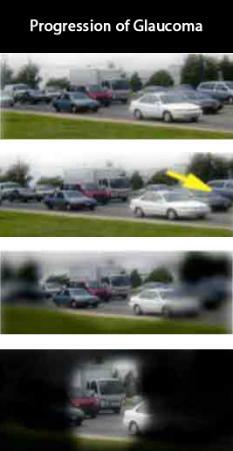 peripheral vision (side vision) decreases. However there is usually no pain and central vision is preserved to the end. 2. Optic nerve changes which are seen by your eye doctor by looking inside the eye with an instrument. 3. Loss of “field” or side vision. 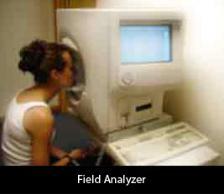 by the machine as field loss and a map is plotted by the computer. gone. This is called tubular vision. changes and gives a report. This is performed every 4-6 months to know if the nerve changes are progressing or not. points on the nerve which is as small as 3 mm in diameter giving us a much more accurate assessment. correct surgical treatment the eye becomes very large and vision is greatly reduced leading to blindness! aggressively treated with IV injection, laser and eyedrops otherwise it will lead to blindness. Diagnosis... State of the Art! to blindness. The Humphrey Analyzer is the Gold standard all over the world. Fields are normally done twice a year. fixation. Can identify pressure accurately even in post operative and highly myopic eyes. 2. Speed up the exit of fluid from the eye by action on the meshwork and other pathways. Diamox tablets are prescribed. A common side effect is tingling and numbness in the hands and feet. that can treat the chronic simple glaucoma as well. back in 2001 and has reported excellent results with it.